AirLink is a new and more flexible Variable Air Volume (VAV) system. It is helping consultants and contractors take the next step in HVAC system efficiency, whilst having the potential to save on capital costs. 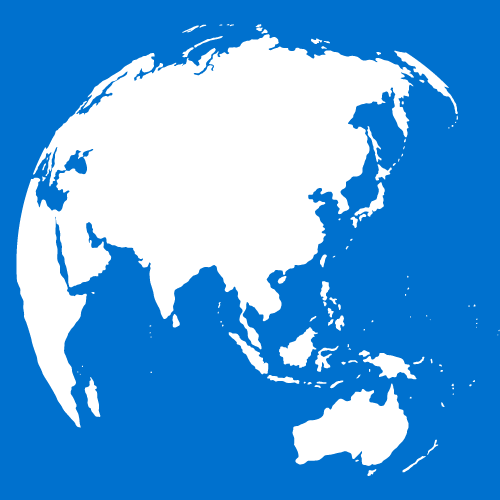 For over 30 years, VAV systems have been the preferred air distribution method. 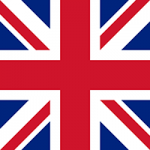 Traditionally these have incorporated an Air Handling Unit or Fan Coil Unit with AC fans. These units are connected to a high-pressure duct network that delivers air through an inefficient VAV box with a fixed geometry diffuser. EC fans have helped to improve the energy efficiency, but the system remains only moderately efficient and is limited in that it cannot be adapted to system layout changes and has the potential for noise issues. 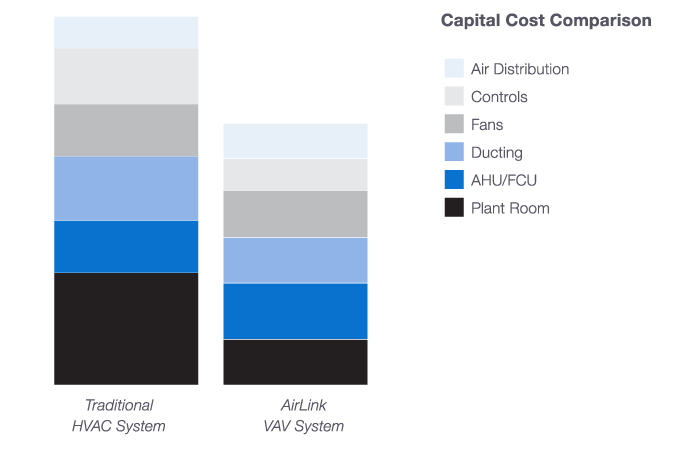 Through the full integration of multiple technologies and low-pressure Static Regain Duct Design, the AirLink VAV System minimises energy consumption and can provide capital savings in almost all HVAC system designs. AirLink delivers a more efficient, more adaptive air distribution solution to help create a healthier, more comfortable indoor space. Capable of precise air delivery to every room, this flexible VAV system is easy to re-zone and changes to the system layout can be made quickly if required. Air Handling Unit or Fan Coil Unit with AC fans connected to a high pressure duct network that delivers air through an inefficient VAV box with a fixed geometry diffuser. Air Handling Unit or Fan Coil Unit with EC fans mismatched to a high pressure duct network that delivers air through an inefficient VAV box with a fixed geometry diffuser. Air Handling Unit or Fan Coil Unit with EC fans matched to an efficient low pressure duct network that delivers air through an intelligent electronically controlled VAV diffuser. This integrated system is very effective in applications where the occupancy level and conditions vary during the day. The ventilation rate automatically adjusts to meet these changing requirements of the area, minimising energy consumption while helping to maintain a healthy and productive environment. The extensive range of sizes for each component make the AirLink VAV system suitable for a vast range of commercial buildings, including schools and universities, hospitals, convention centres and office blocks. Air Design Air Handling/Fan Coil Units are engineered and manufactured to the highest standard. They are fitted with highly advanced single or multiple EC plug fans that can deliver the full range of air flows with maximum efficiency. They also include dependable and high quality filters that provide integrated air filtration for most types of applications. The Rickard Electronic VAV Diffuser range is an intelligent modular system that is zoned into independently controlled comfort areas. The system can be centrally monitored and tuned from the one location via a BMS, as well as adjusted within the occupied space. It can be used in most building types and sizes due to the simplicity of its design and flexibility of the system software. The extensive range of Elta Fans Adjustable Pitch Axial fans is an essential part of the integrated AirLink system. Their high performance impeller blade harnesses the latest construction and design technologies to deliver enhanced pressure development, energy efficiency and reduced noise levels throughout the system. 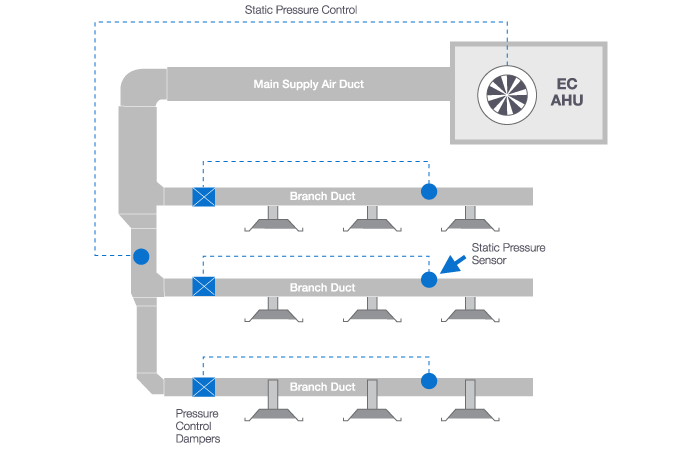 An AirLink VAV system combines Static Regain ducting, electronic VAV diffusers and Air Handling Units/Fan Coil Units with EC fans, to achieve capital savings in almost all building types. 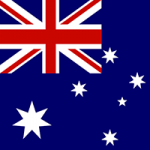 Independent analysis that supports this has been produced based on a range of different building types in Australia. In addition to the initial capital savings, Air Design’s AHUs and FCUs can provide lower “lifetime” costs. Their fully integrated and compact EC fans are faster and easier to replace than traditional DWDI fans. This can potentially eliminate the need for cranes or gantries and reduce on-site labour costs. The objective of Static Regain Duct Design is to achieve the same static pressure throughout the duct run. This means the duct design must have an even static pressure from the first diffuser take off. Any duct design method can be adopted for the main supply air duct. The static pressure should be the same before every VAV diffuser and at each branch. The pressure at each diffuser does not need to be perfectly even as the VAV diffuser can manage a 10% tolerance with ease. This duct design strategy is illustrated in the diagram.